The Office of Missing Persons (OMP) was legislated. It has elicited words of appreciation from several quarters. In doing we may forget similar inquiries from the past. The JVP commenced its second insurrection in the South, purportedly in protest against the Indo-Lanka Accord. This was a result of the JVP being falsely implicated for the riots of July 1983 which either gave the leadership a very good reason to go underground or they were simply driven underground to survive as a party. Key UNP leaders were among those assassinated. With the Public Security Ordinance and Prevention of Terrorism Act in force during this period, government and paramilitary forces responded by engaging in a systematic practice of extrajudicial killings, enforced disappearances and torture. 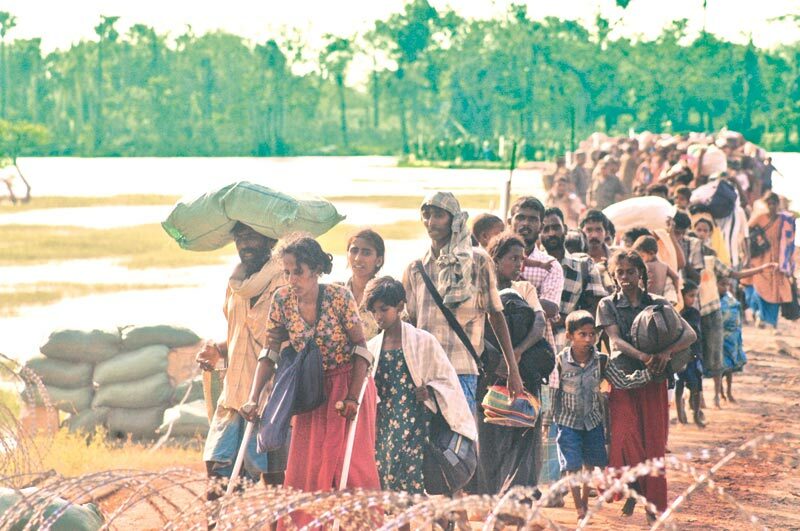 Thousands of ordinary Sinhalese civilians were killed. Regulations were promulgated under the PSO permitting arbitrary arrest and detention either for preventive or investigative purposes, as well as to give authorised officers the authority to bury or cremate dead bodies. If the JVP had not been driven underground the horrendous history of that period may have well been different. In the absence of proof, the dead remain classified as missing being, the body and not the person. As an All Island Commission stated, “although bodies were found in a mere six hundred and 47 cases, in the given context, the word disappearance is only a euphemism for the death caused by extra-judicial killings”. Investigating murder is the task of a country’s criminal investigation apparatus being the investigative and prosecutorial departments, the Attorney General’s department. Illustrative of the record of past inquiries are the work of CoI which looked at involuntary removal or disappearances of persons in the Central, North Western, North central and Uva provinces which received fifteen thousand and 45 complaints, six thousand four hundred and 43 complaints were inquired into and eight thousand six hundred and two complaints were remaining at the conclusion of the Commission. The CoI into disappearances in the Western, Southern, and Sabaragamuwa Provinces received eight thousand seven hundred and 39 complaints, of which 191 were from returned detainees and twelve were of physical injury. It published the names of the disappeared, names of complainants, addresses of complainants and relationship between the disappeared and complainant. About 7,761 complaints were inquired into and 542 remained at the conclusion of the Commission. The Commission found that 7,239 complaints were proved. About 9,744 witnesses testified before the Commission, including 54 special witnesses. The Commissioners recommend that the investigations by the IGP should be under the supervision of the Attorney General and be referred to the Attorney General for the determination of the appropriate legal proceedings that should ensure. The CoI into disappearances (All Island) had 10,136 complaints handed over to the Commission from the three zonal Commissions. About 6,345 were fixed for inquiry. Of those, 4,473 were inquired into by the Commission. Of the 654 complaints pertaining to returned detainees, the Commission inquired into 384 of them. Significantly, the passage of time and the loss of hope were cited as major factors in non-appearance of complainants. The three examples cited show testimonies have been recorded. facts ascertained in some instances. reasons to look further into homicides provided whilst the identity of those not heard is known. The OMP of the future should not look to rerecord what is known. It should rather hold to account agencies whose task it is to look at homicides. It can call for the testimony of those willing where they have not been heard. The OMP and parties such as the TNA and JVP can in fact support victims in making submissions. The Human Rights Commission was for some time also looking into disappearances. The HRC can well support victims’ families in instances where past commissions have recommended prosecutions or investigations by criminal investigation agencies. Victims have been traumatised at all stages of the legal process, ranging from transfer of cases (from local courts to judicial forums situated in predominantly majority provinces or the capital) to painfully protracted legal proceedings which they are required to attend despite financial and social hardships. Recommendations of these bodies - even when they have been functioning credibly - have had negligible impact insofar as actual prosecutions emanating from these findings are concerned. The question of legal accountability for grave human rights violations of civilians of the majority Sinhala ethnicity as well as the minority Tamil and Muslim ethnicity and others has remained unaddressed for decades. The quote on persons of Tamil origin reported missing before the Southern Commission and its response requires further inquiry at the least. The rush to pat ourselves on the back for legislating the OMP we must not forget past recorded history particularly those in reports which refer to the law, the grey areas, the weaknesses, the loopholes, loss of evidence and shortage of human resources in the arena of investigations and prosecutions. Even if many of these sources of concern are addressed there are practical hurdles to overcome seen clearly in the ongoing investigations pertaining to Ekneligoda.